Cook the pasta in boiling water for approximately 8 minutes, stirring occasionally. While the pasta is cooking, stir-fry the garlic and onion in the oil until the onion is translucent. Add the shrimp and sauté until they completely change color from a gray to a pink color. Incorporate the tomato paste and cook for 1 additional minute. Add the wine and let reduce. Pour in the cream and cook over medium heat for 8 more minutes. Mix the pasta with the sauce, sprinkle with the chopped onion and serve. You can swap out shrimp for crab or lobster. Pasta is my favorite go-to food; it’s versatile and both kids and adults tend to like it. The flavor and texture of noodles make it possible to prepare a number of delicious dishes. 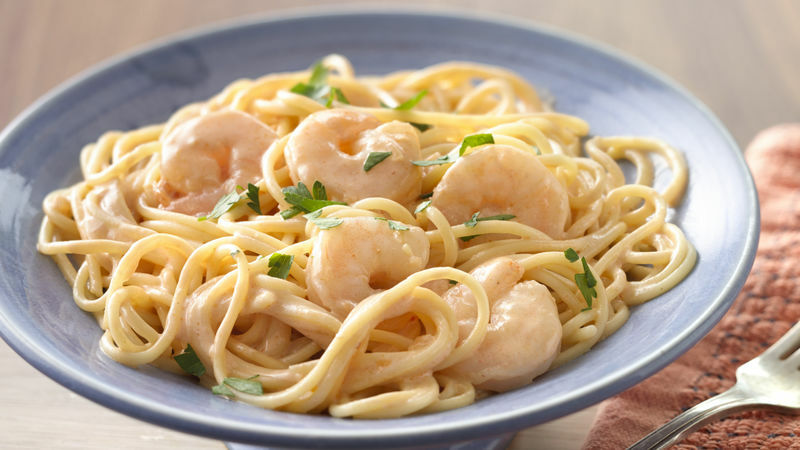 This pasta with a creamy shrimp sauce is a slightly gourmet variation of a meal my sister and I used to prepare when we were younger. We made a creamy sauce with tuna, which we added to spaghetti. This time, to give our tried-and-true recipe a special touch, I’ve swapped out tuna for shrimp, my favorite. The best thing about this dish is that you can have dinner ready in only 20 minutes.